Kia Motors has revealed its new all-electric concept car, Imagine by Kia, at the 2019 Geneva International Motor Show. 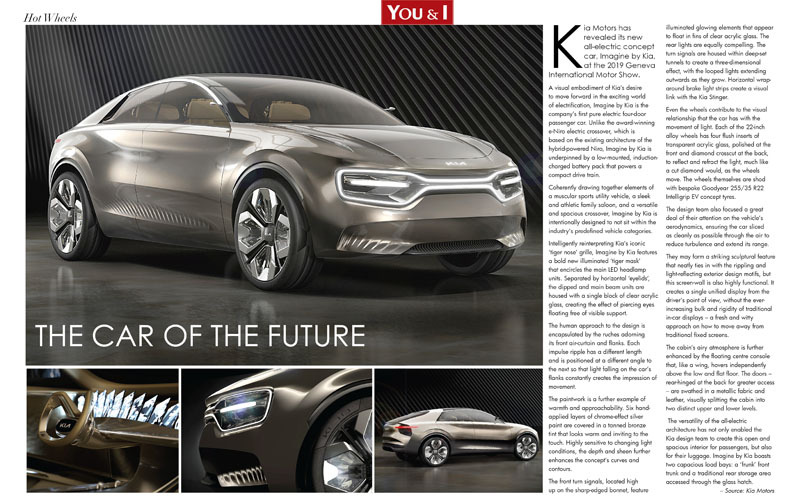 A visual embodiment of Kia’s desire to move forward in the exciting world of electrification, Imagine by Kia is the company’s first pure electric four-door passenger car. Unlike the award-winning e-Niro electric crossover, which is based on the existing architecture of the hybrid-powered Niro, Imagine by Kia is underpinned by a low-mounted, induction-charged battery pack that powers a compact drive train. Intelligently reinterpreting Kia’s iconic ‘tiger nose’ grille, Imagine by Kia features a bold new illuminated ‘tiger mask’ that encircles the main LED headlamp units. Separated by horizontal ‘eyelids’, the dipped and main beam units are housed with a single block of clear acrylic glass, creating the effect of piercing eyes floating free of visible support. The front turn signals, located high up on the sharp-edged bonnet, feature illuminated glowing elements that appear to float in fins of clear acrylic glass. The rear lights are equally compelling. The turn signals are housed within deep-set tunnels to create a three-dimensional effect, with the looped lights extending outwards as they grow. Horizontal wrap-around brake light strips create a visual link with the Kia Stinger. Even the wheels contribute to the visual relationship that the car has with the movement of light. Each of the 22-inch alloy wheels has four flush inserts of transparent acrylic glass, polished at the front and diamond crosscut at the back, to reflect and refract the light, much like a cut diamond would, as the wheels move. The wheels themselves are shod with bespoke Goodyear 255/35 R22 Intelligrip EV concept tyres. The design team also focused a great deal of their attention on the vehicle’s aerodynamics, ensuring the car sliced as cleanly as possible through the air to reduce turbulence and extend its range. They may form a striking sculptural feature that neatly ties in with the rippling and light-reflecting exterior design motifs, but this screen-wall is also highly functional. It creates a single unified display from the driver’s point of view, without the ever-increasing bulk and rigidity of traditional in-car displays – a fresh and witty approach on how to move away from traditional fixed screens. access – are swathed in a metallic fabric and leather, visually splitting the cabin into two distinct upper and lower levels. The versatility of the all-electric architecture has not only enabled the Kia design team to create this open and spacious interior for passengers, but also for their luggage. Imagine by Kia boasts two capacious load bays: a ‘frunk’ front trunk and a traditional rear storage area accessed through the glass hatch.